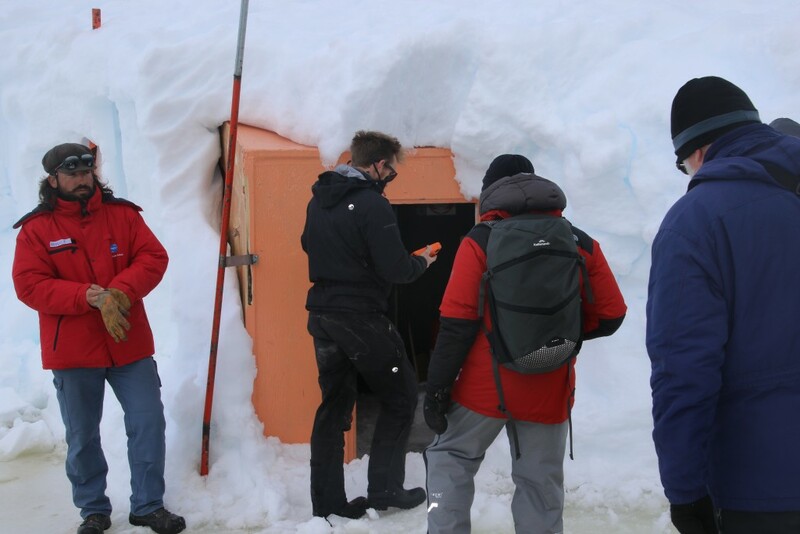 Travelling to Dumont d’Urville Station, France’s main Antarctica research base, is certainly no easy task. 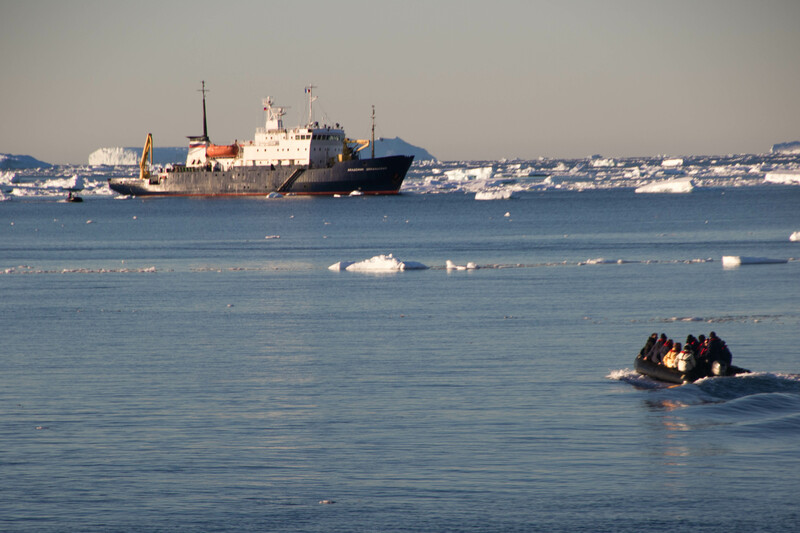 Travellers on Chimu’s recent voyage to East Antarctica caught a rare glimpse of the French Antarctic Programme. This was the first time the station had been visited by a cruise ship in over 5 years. Base view from ship in Antarctica, photo credit: Chad Carey. The station is large by Antarctica station standards and in summer months it houses over 100 scientists and support staff. 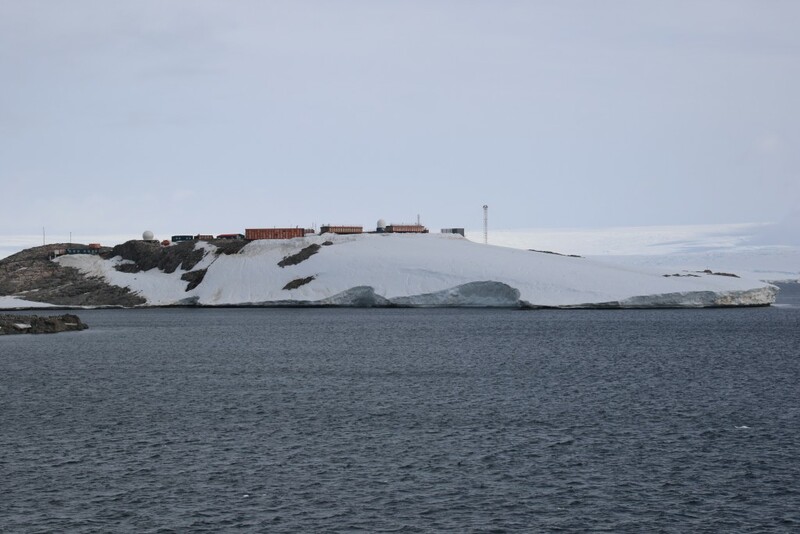 It also provides logistical support to Concordia research station, an Antarctica Ice Cap station shared by France and Italy which is located approximately 1000 km inland from Dumont d’Urville Station. The timing of our visit was very fortunate as the French supply ship Astrolabe had only dropped suppliers a few days earlier and we could make out large trucks in the distance on the continental cap who had just started on their four week overland journey to Concordia Station to provide much needed supplies for the scientists working there. A strange sight that very few people have ever had the pleasure of witnessing. Arriving at the base via zodiac we came ashore at the ill-fated French Antarctica programme runway. The runway was the cause of international controversy in the 1990s as the French levelled three islands in order to build it to the required length. Greenpeace, the Australian and New Zealand governments put pressure on the French as a result and eventually the runway was abandoned. No aircraft was ever landed on the runway even though it was mostly complete and the major environmental damage had been done. The air traffic control tower still stands, disused. As fate would have it the nearby glacier broke off soon after the decision and a large iceberg blocked the end of the runway anyway. With needing to deal with environmental factors like this in the Antarctic, it’s unsure if the runway would have ever been regularly used anyway. From the runway there are a series of raised walkways up to the station. 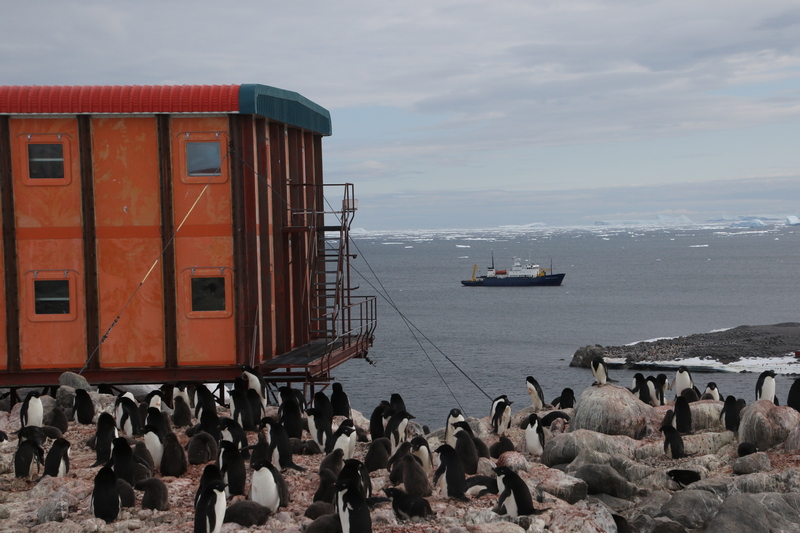 The station is almost entirely surrounded by penguin rookeries and as such these raised walkways were created over the top of the penguins to ensure as little disruption as possible. We were first welcomed into the main bar/ living area where we met some of the French scientists and support staff. 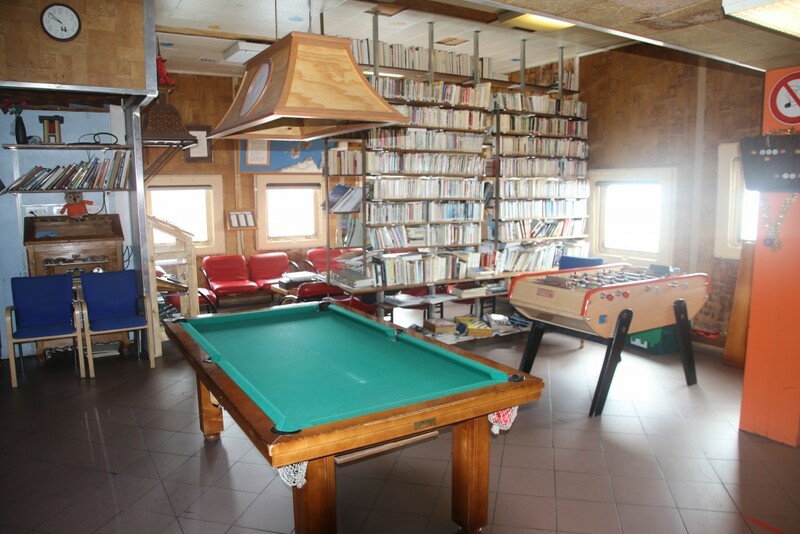 The living area was well equipped with a large library, lounge area, pool table and darts. The dining area also doubled as a dance floor, all essential outlets for the long winter months. But even these common areas had a distinct French feel. Each dining table had an assortment of soft cheeses and the bar was well stocked with good French wine. We also visited the post office from where we were to send our obligatory postcards. The post would need to wait until the next resupply and even then would first be sent to France for processing, so it would take months before it would reach its destination. Finally we had a tour of some of the scientist’s work areas and even though it was a Saturday there were scientists hard at work. Lastly we were given a bit of a treat. The French team had used some earthmoving equipment to dig out an old overwintering capsule, used in the fifties. Being disused, it was now a couple of meters under the snow and the earthmoving equipment had only managed to clear one side where there was a small orange door. 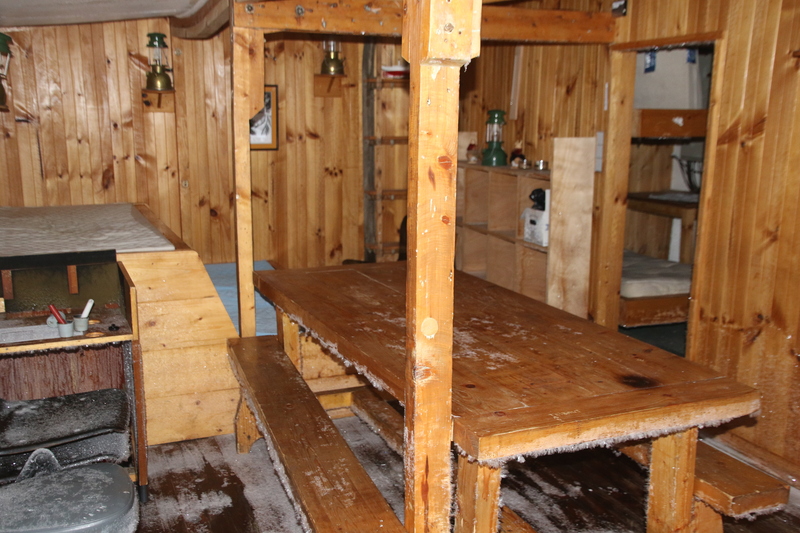 We were then permitted to climb inside the module which was still intact with its 1950’s decor. There was no heating and little options in terms of entertainment or distraction and it really gave an impression of how isolated the men would have felt in these early expeditions. Continue reading about Antarctica with 20 Super Cool Facts About Antarctica you didn’t know or check out the possibilities for a cruise to Antarctica here.